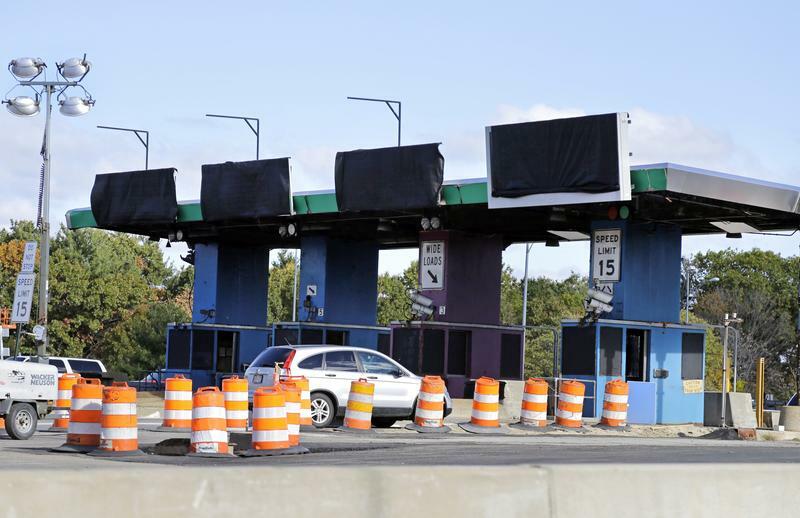 A car travels through a partially dismantled toll booth on the Massachusetts Turnpike in 2016. Boston migrated to all-electronic tolling on the Mass Pike that same year. New York Governor Andrew Cuomo says cashless tolls will be installed at Thruway toll plazas in Westchester, Rockland, and Orange Counties by the end of the year. The cashless tolls will be set up in Yonkers, Spring Valley, and Harriman on the New York State Thruway, and in New Rochelle on the New England Thruway. Cuomo announced earlier this year that the entire 570-mile Thruway system will be converted to cashless tolling by the end of 2020. Cashless tolling was first introduced in 2016 at the Tappan Zee Bridge, which was renamed the Governor Mario M. Cuomo Bridge in 2017. It is also now in place at all MTA bridges and tunnels in New York City.